The British naturalist Gilbert White in 1789 was one of the first people to separate the three similar-looking summer visiting warblers, Chiffchaff, Willow Warbler and Wood Warbler. He did it by listening to their songs as reported in his famous book The Natural History and Antiquities of Selborne, Almost two hundred years later in 1968 a group called the "Small Faces" used the Chiffchaff song towards the end of their song "Lazy Sunday" which reached number two in the UK singles chart. The name of the bird reflects its song with two phrases that sound like "chiff" and "chaff" that are repeated in different combinations. It is a true song of approaching summer. eye stripe through the eye, a pale eyebrow (supercilium) and a thin pale eye ring. The Chiffchaff is practically indistinguishable from the Willow Warbler, though it is less yellow and often has darker legs. Chiffchaff also tend to be found towards the tops of trees and bushes, in woodland areas, whereas Willow Warblers are more often lower down in more open, scrub areas. The best way of distinguishing the Chiffchaff from the Willow Warbler is by its song. 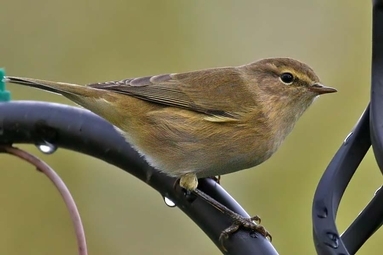 The Chiffchaff's song sounds like its name while the Willow Warbler's song is a melodic rippling phrase that rises quickly before slowly dying away. Chiffchaffs feed on insects, such as midges and other flies, and caterpillars and moths, which they find by foraging in tree canopies and among bushes. Indeed their Latin family name, Phylloscopus, means leaf explorer and Chiffchaffs search the undersides of leaves where aphids congregate and feed on the tree's sugary sap. The female Chiffchaff does the nest building. The domed nest is built on or very close to the ground in tall grass, bushes, or wall creeping plants. Dead vegetation (stems and leaves) are used for the construction, with a thick feather lining. The duties of incubating the eggs are performed by the female. The eggs are about 15 mm by 12 mm, smooth and glossy, white with purplish or black markings. The young birds are fed by the female only. The male seems to do little more than sing….listen for his song this summer. There are an increasing number of Chiffchaffs over-wintering in southern Britain. The majority of these winter Chiffchaffs are birds from Scandinavia and mainland Europe.